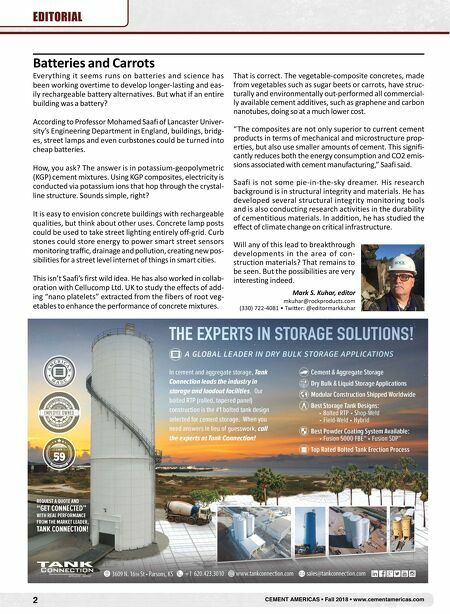 www.cementamericas.com • Fall 2018 • CEMENT AMERICAS 3 CEMENTSCOPE New Smart Cement Mixture Can Store Electrical Energy The discovery of new cement mixtures by researchers at Lancaster University in England could turn buildings, bridges, street lamps and even curb-stones into cheap batteries. The mixture, which is made from fly ash and chemical solutions, is able to store electrical energy through the diffusion of potassium ions and can monitor its own structural health. The potassium-geopolymetric (KGP) composites are cheaper than ordinary portland cement – the most widely used construction material, the researchers said. They are easy to produce and, because conductivity is achieved by potassium ions hopping through the crystalline structure, it does not need any complex or expensive additives. The researchers' KGP composites rely on the diffusion of potassium ions within the structure to store electrical energy and to sense mechanical stresses. When fully opti- mized, KGP mixtures could have the potential to store and discharge between 200 and 500 watts per square meter. 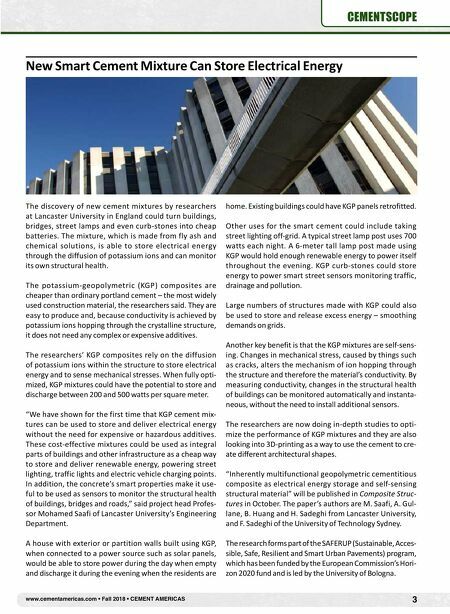 "We have shown for the first time that KGP cement mix- tures can be used to store and deliver electrical energy without the need for expensive or hazardous additives. These cost-effective mixtures could be used as integral parts of buildings and other infrastructure as a cheap way to store and deliver renewable energy, powering street lighting, traffic lights and electric vehicle charging points. In addition, the concrete's smart properties make it use- ful to be used as sensors to monitor the structural health of buildings, bridges and roads," said project head Profes- sor Mohamed Saafi of Lancaster University's Engineering Department. A house with exterior or partition walls built using KGP, when connected to a power source such as solar panels, would be able to store power during the day when empty and discharge it during the evening when the residents are home. Existing buildings could have KGP panels retrofitted. Other uses for the smart cement could include taking street lighting off-grid. A typical street lamp post uses 700 watts each night. A 6-meter tall lamp post made using KGP would hold enough renewable energy to power itself throughout the evening. KGP curb-stones could store energy to power smart street sensors monitoring traffic, drainage and pollution. Large numbers of structures made with KGP could also be used to store and release excess energy – smoothing demands on grids. Another key benefit is that the KGP mixtures are self-sens- ing. Changes in mechanical stress, caused by things such as cracks, alters the mechanism of ion hopping through the structure and therefore the material's conductivity. By measuring conductivity, changes in the structural health of buildings can be monitored automatically and instanta- neous, without the need to install additional sensors. The researchers are now doing in-depth studies to opti- mize the performance of KGP mixtures and they are also looking into 3D-printing as a way to use the cement to cre- ate different architectural shapes. "Inherently multifunctional geopolymetric cementitious composite as electrical energy storage and self-sensing structural material" will be published in Composite Struc- tures in October. The paper's authors are M. Saafi, A. Gul- lane, B. Huang and H. Sadeghi from Lancaster University, and F. Sadeghi of the University of Technology Sydney. The research forms part of the SAFERUP (Sustainable, Acces- sible, Safe, Resilient and Smart Urban Pavements) program, which has been funded by the European Commission's Hori- zon 2020 fund and is led by the University of Bologna.